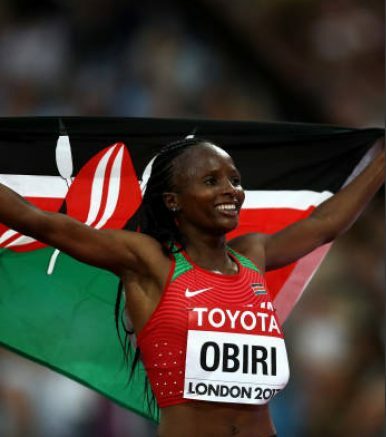 13th August 2017 – Having been virtually untouchable all season, former World Indoor Champion Hellen Obiri (KEN) added a World Outdoor crown to her list of achievements. After a very cagey opening to the 5000m final, the race boiled down to a dual between Hellen and her Ethiopian competitor Almaz Ayana. Ayana tried hard to break Hellen with some aggressive front running but Hellen was too strong and covered every move. With 300m remaining, Hellen hit the front and powerfully moved away having time to celebrate as she crossed the line in 14:34.86. The was just the tip of very successful final two sessions for PACE athletes that saw relay silver medals for Dina Asha-Smith (GBR) in the Women’s 4x100m, Perri Shakes-Drayton (GBR) women’s 4x400m and Fred Kerley (USA) in the men’s 4x400m. Not far behind Fred came the British team for which Matthew Hudson-Smth (GBR) ran the opening leg and saw him gain a bronze medal. Sir Mo Farah (GBR) brought the curtain down on his championship track career with yet another medal, and although it was not the gold for which he had hoped, his silver gave him a total of 8 individual medals. During the conclusion of the final nights events, Usain Bolt (JAM) was given a lap of appreciation by his army of fans, not just in the stadium on the night but by those around the world.